Two years ago, the Port Authority faced an empty World Trade Center site with companies showing little to no interest in locating downtown. It seems 1 World Trade Center is the address to have these days. After having settled on its new headquarters at 1 Bryant Park, Bank of America is entertaining the possibility of 1 million more square feet at the World Trade Center. Bank of America’s interest comes on the heels of magazine giant Conde Nast locating their new headquarters at 1 World Trade Center. Douglas Durst, along with Larry Silverstein are the two main developers responsible for the rebuilding of the World Trade Center site. Silverstein also owns and operates the glass behemoth, 7 World Trade Center. Bank of America is prospecting locations in both midtown and downtown. 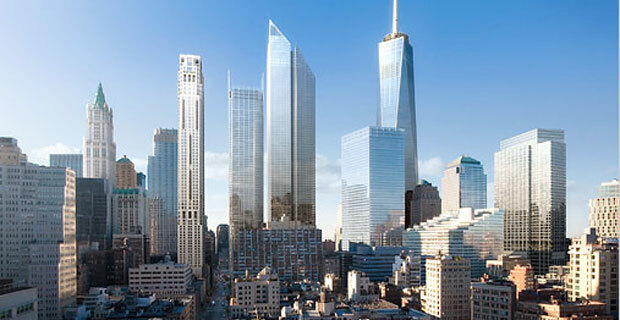 “Downtown, only 1WTC (in which Durst now holds a minority stake) is in fullbore construction for completion in 2013. Larry Siverstein’s 4 WTC could offer comparable modern space, but construction above a six-story base awaits completion of a financing agreement between him and the PA,” according to the same article.